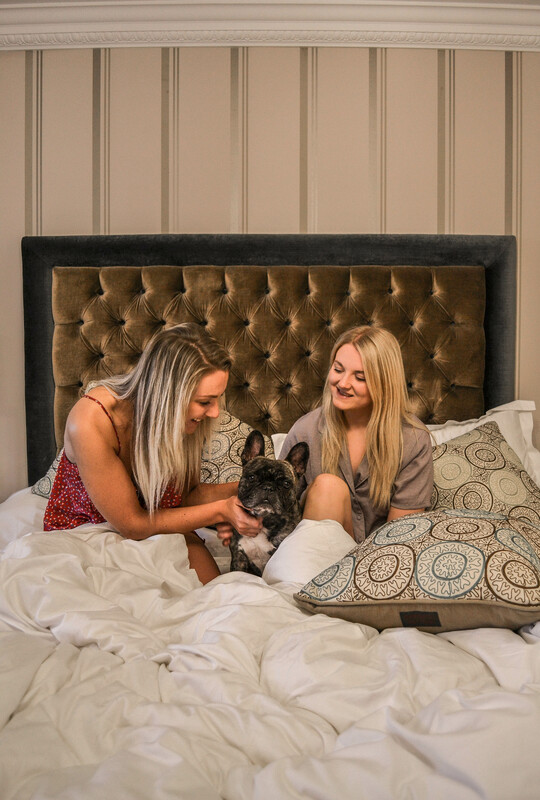 A few weekends ago we continued our search for the best Dog Friendly Hotels around the U.K and stayed at Pennyhill Park, part of the Exclusive Hotel collection. Now, this isn’t the first time we’ve worked with Exclusive Hotels. We’ve previously stayed at South Lodge in Horsham, West Sussex and we have to say it was truly incredible. Therefore, we had high hopes for Pennyhill Park and we weren’t disappointed. Four legged friend in tow, Natalie picked me up from my offices in Hammersmith after work. 40-minutes later we found ourselves driving up the driveway to Pennyhill Park in Bagshot, Surrey. A pretty smooth drive seeing as we’d left London in the height of rush hour, something we’d usually avoid completely! But, Pennyhill Park was calling our names. As we drove up the pretty long driveway to reception we caught a glimpse of the 123 acres of stunning Surrey countryside which surrounds the hotel. Oh, and also the training ground for the England rugby team. Unfortunately no lights were on, but don’t worry, we’d be back in the morning. Once we’d reached reception we couldn’t wait to get inside and see more of the hotel. We loved the mixture of the old and modern buildings. Plus, we could see the warm log fire through the window. Pulling our suitcases -you wouldn’t think we were only staying for one night- and Gus behind us, a lovely man from the hotel offered to help us carry our bags to our room. We were staying down by the Terrace in the Turnberry room. The room had a double bed, was beautifully decorated and was absolutely huge, meaning Gus had plenty of space to run around. There was even a backdoor so Gus could go outside whenever he wanted… on his lead of course. Plus, we found a wonderful welcome present in the shape of a sparkling wine bottle and some delicious chocolates which, if we’re honest, didn’t stay around to long. But, we weren’t the only ones who had been treated as Gus has his own bed, bowl and some peanut butter treats! After most/all of the bottle was in our stomachs and chocolate wrappers scattered the room, it was time to head to dinner. Unfortunately, unlike South Lodge, we weren’t able to dine with Gus in The Brasserie restaurant where we had booked into dinner. However, instead of leaving Gus in the room we were luckily able to leave him at Doggy Dinner Daycare (we came up with that all on our own…) at the reception. He had his own bed, bowl and to be honest, probably didn’t even realise we were gone. The Brasserie had a relaxed and lively atmosphere, meaning we were able to kick back and enjoy our food, oh, and those extra two glasses of wine. The food at The Brasserie was delicious, not to mention the complementary crusty bread and salted butter… literally a highlight to most of the meals we have. To start Natalie opted for the Duck Egg with Smoked Ham and Sourdough Soldiers, while I tucked into some Chickpea Frittatas with Mango and Coriander Yogurt. Then for mains we went for the Truffle Mac and Cheese with three cheeses -one is simply not enough- and the creamy Mushroom Risotto. Now, if you’ve been reading our blog for a while what I type next may surprise you… we were too full for dessert. We’re 100% sure the desserts on the menu were amazing, but our stomachs were saying no. Therefore, we picked up Gus from reception -he looked adorable sleeping in his bed- and finished our wine off by the open fire before heading to bed. The next morning we were up bright and early, made ourselves some tea and snuggled down with Gus to watch the sun start to creep through the windows. Afterwards, we jumped out of bed to get ready and head to breakfast… apart from Gus, he was not moving. Therefore, we decided to leave him in his slumber. Breakfast at Pennyhill Park was incredible. From fruit, yogurt and granola to fry ups, crumpets and pastries, it literally had everything you could want for breakfast. They even had the widest selection of juices we’d probably seen at a hotel. Blueberry juice? Yes please. It was delicious and in our opinion you can tell a lot about a hotel by what it offers for breakfast. We went in pretty hard and ate our way around the room… probably making up for those desserts we’d missed the night before. Therefore, by the time we were finished we definitely needed to walk it off. Luckily, that’s exactly what we had planned. By the time we got back to the room Gus had woken up and was ready to head outside and explore the 123 acres which surround Pennyhill Park. We walked for over an hour, stumbling across ponds, flowers and even a huge Cedar tree, which the hotel say is 600 years old. If you have more time you could even head into Swinley Forest next door. Now, if you want to do something a little more relaxing with your time then we’d 100% recommend heading to the spa for a swim, massage and simply relax. However, as we couldn’t take Gus in for a pamper as well we opted for the great outdoors. Plus, if we’re honest, there’s nothing we love more than exploring the countryside – bet you never thought you’d hear two London girls saying that eh? Pennyhill Park also has a gym, tennis court, 3-hole golf course and screening room. If you want to venture further afield then the hotel is only a 15-minute drive from Ascot Racecourse, 28-minute drive from Hampton Court Palace and 30-minute drive from Painshill Park. So, trust us when we say you will not get bored. *This trip was gifted by PennyHill Park, part of Exclusive Hotels.